Hailstorms can ruin your car’s finish and leave noticeable dents on its surface. It’s not easy to repair car hail damage, and it’s usually not cheap, either. 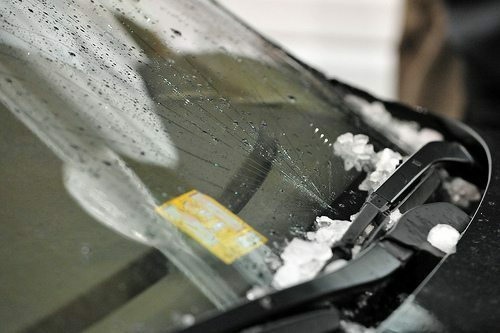 Typically, the damages your car receives during a hailstorm require the services of a professional auto repair shop. Protect your car from further damage. If you have windows that have been broken, carefully gather the big pieces and vacuum up the smaller ones. If possible, move your vehicle into a garage or under a covered area. If you can’t, cover your windows so that further rain won’t damage the interior. Do not go out to cover your car’s windows in the middle of a hailstorm. It’s possible you’ll end up with hail damage to your car AND hail damage to yourself. File your claim. Call your insurance company immediately after the storm. You’re covered for hail damage if you’ve purchased comprehensive insurance coverage. You will have to pay your deductible amount. Major hail damage can total a car. If you have any questions about your coverage, contact your insurance company for answers. After your car is looked at, you can choose to have your car repaired or not. If you choose to have your vehicle repaired, notify your insurance company and let them know which body shop you are going to use for the repairs. Select a repair company. Some body shops will want to see your vehicle before they schedule your repair in order to ensure the insurance estimate was written accurately. Other body shops will deal with this issue after you leave your car with them to begin the repair. The body shop will notify the insurance company if they feel the estimate is written for the wrong type of repair or written too light. In most cases, you don’t have to get involved with this process. The body shop will rewrite the estimate or create a supplement for the insurance company to approve. Save time and money by asking your insurance company if it has a preferred PDR (paintless dent repair) provider. FYI – Great Plains Auto Body Repair is. No matter who you choose, make sure it is a local company with a history in the community. Too many times when major hailstorm hits ‘chasers’ will come into the area, set up shop and get a resident phone number to seem local. The problem is, if you have issue in the future with the repair they will not be around to fix the concerned area. Be prepared the next time around. Hailstorm damage and the problems that follow can easily be avoided by taking a few precautions: try to park in a shaded or covered area, especially during seasons when hailstorms are prevalent. If you’re going to be going out of town, make sure that your car is parked in an enclosed area.